Craving the convenience of a just-add-water meal, but need something a little healthier and more satisfying than an old-school cup of noodles? You got it! Prep a few of these spiralized-zucchini mason jars over the weekend, and you'll look forward to weekday lunches like never before. Bonus: See the video! Bring a skillet sprayed with nonstick spray to medium heat. Season chicken with salt and pepper. Cook for about 4 minutes per side, until cooked through. Use a spiral veggie cutter like the Veggetti to cut zucchini into spaghetti-like noodles. (If you don't have a spiral veggie slicer, peel zucchini into super-thin strips, rotating the zucchini after each strip.) Roughly chop for shorter noodles. In a wide-mouth, quart-size mason jar, gently break apart bouillon cube into very small pieces. Chop chicken, and add to the jar. Add zucchini noodles and seasonings. Top with remaining ingredients. Seal and refrigerate (if not eating immediately). Once ready to eat, add 2 cups boiling water. Gently stir. Reseal jar, and let sit for 15 minutes, or until zucchini has slightly softened and bouillon has dissolved. HG Alternative: Once ready to eat, add 2 cups water. Gently stir. Microwave for 6 minutes, or until zucchini has softened and bouillon has dissolved. 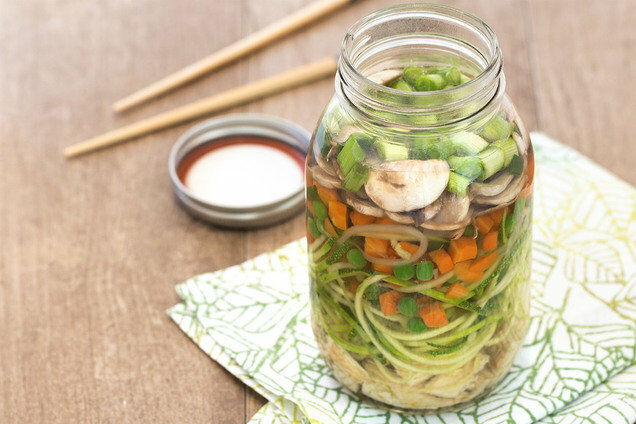 Hungry for More Healthy Meals in a Jar? It's National Greasy Foods Day, October 25th. Skip the grease, and make these Bake-tastic Butternut Squash Fries instead. You'll be happy you did! Give your buddies the gift of convenient recipes! Click "Send to a Friend" now.